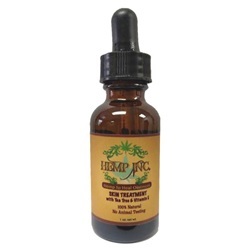 Hemp Miracle Oil is a 100% natural blend of Hemp Oil, Tea Tree Oil, Vitamin E, and 9 other beneficial essential oils that deeply soothes and moisturizes dry, irritated skin leaving it soft, smooth and deeply nourished. For all skin types, this has been touted as a "must-have" hemp product. The fragrance of the Hemp Miracle Oil is derived from natural sources.